So the last time I remember celebrating Bihu with family was way back in 2010 and since then, I have missed almost every festivity. It’s a little difficult to explain the feeling of being away from home when one of your favourite festivals is being celebrated. Yesterday, when I saw my neighbours celebrating Lohri, it made me a little nostalgic as it brought back to me memories of my childhood Bihu celebrations. A recent educational trip of Delhi University to Assam gave me a unique opportunity of visiting my own home state as a tourist. And must I here mention that, when you observe a culture as an outsider, it becomes more interesting. At times, you might be a part of a culture, but might not appreciate it unless you properly estimate its heritage. This trip probably made me realize how close I am to my culture and my land and how much I know about my state. It made me realize that though out my childhood I have been attached to a certain way of life, which I might never get an opportunity to relive again. With around 120 students from all around the country, I explored my land in a way which I never imagined before. For the background, must I here mention that Bhogali Bihu, one of the three Bihus we celebrate, is our harvest festival. Rongali Bihu is celebrated to mark the beginning of the Assamese new year and is probably the most well known of all three versions, and it is this Bihu with which you can associate the famous Bihu dance with. Bhogali Bihu, being the harvest festival is associated with a community fest, which everyone joins in for a huge get together on the night before the Bihu (called Uruka). 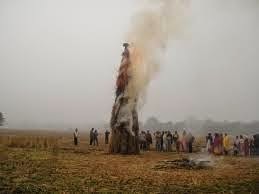 Traditionally, people erect makeshift huts and pyramid shaped structures, known as Bhela Ghor and Mehi, from bamboo, leaves and thatch, in which they eat the food prepared for the feast, and then burn the huts the next morning (Bihu Day). I basically belong to a very remote village of Baksa District in Assam. I was born in a village few kilometres from Bhutan border called Garmara of the Barama constituency. Barama located 80 kms from west of Guwahati, is probably one the most rural places of Assam and as such tradition still holds a firm grip onto communities residing in the area. I moved out of the village within two years of a birth as my mom and dad decided to settle in Guwahati. However we still remain the only people in the entire family to move out of the village with 99% of the family still residing in those remotest corners of the country. Having brought up in the cosmopolitan environment of Guwahati, my only gateway to rural life enriched with rich Assamese culture was during these festivals like Bihu. Every year we used to drive back to our village a day prior to the festival, and the curious child inside me used to explore the happenings around me. I remember my cousins enthusiastically constructing Bhela Ghors and Mejis and spending the entire night dancing and singing Bihu songs. The real test was early next morning as tradition has it that you need to take a bath before you burn the structures. In the chilly January mornings, bathing by sitting under the tubewell, in the open, was indeed a daring task. Once done, elders offer prayers and then the mejis and bhela ghors are burnt by the young ones. After this follows the grand traditional Assamese breakfast with laru, pitha, doi (curd) and sira (Flattened rice). After some quality time in village, we used to return back to Guwahati, eagerly awaiting for the next Bihu. Gone are those days. It’s been almost 10 years now since I last visited my ancestral place. During my trip as I travelled across some familiar places, it reminded me of those days. And today, as I sit alone inside a South Delhi cafe on Uruka, I just can’t stop being nostalgic about those days.